The Targa Florio road race around Sicily left the international calendar in the 1970s for being too dangerous, but it has made a comeback in recent years as a vintage and a rally event. Today, the race was canceled following a fatal crash between a father-daughter team and a course marshal. 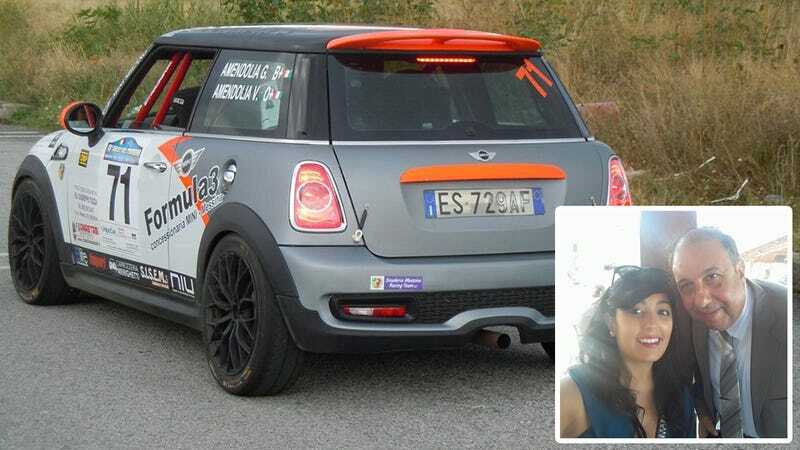 The Mesina-Racing Mini Cooper JCW, running the Sicilian father-daughter team, slid off the road on a special stage of the Targa Florio today and hit one of the course marshals, as La Repubblica reports. The marshal and the driver, 53-year-old Mauro Amendolia, were killed instantly, while the driver’s daughter, 27-year-old Gemma Amendolia, the car’s navigator, was taken by helicopter to a hospital. She is in serious condition with a head injury. Normally Gemma races with her sister, but for the Targa her father took her place at the wheel. The car crashed on a straight section of road. The race organizers called the crash “inexplicable’ in their official cancelation statement, while La Repubblica reports that bumps in the road or slick conditions from the morning could have led to the crash. The car left the road midway through a special stage just after noon today. This is the second day of the rally. The Targa Florio built up a reputation as the most grueling, challenging, legendarily difficult road race of the classic era, where top-level sports cars raced through main streets of Sicilian villages. It is one of the oldest races in motorsports, and this year was its 101st running. Speeds got too high in the mid 1970s and the race was dropped from international competition. Even its more recent rally revival has been fatal, with a 24-year-old rally co-driver dying in a crash into a guardrail in 2012.